Matt Dea says he is 'ecstatic' to be a part of the Bombers' 2019 campaign. When Matt Dea was delisted by Richmond at the end of 2014, the versatile defender felt relatively comfortable with what lay ahead of him. Then 23 years old, there was plenty of life left in his footballing adventure and no need to fret about the future away from the sport. But in late October last year, things were different. “As soon as the season finished, I felt I was a reasonable chance to be signed on – I’d finished the year playing in the ones and played 12 games for the year,” Dea said. “I thought I’d played a decent season, so I was reasonably confident. But the longer you don’t hear anything, you start to see the writing on the wall. Delisted for the second time in his career, Dea felt overwhelmed. “When you’re younger it’s easier, because when you start to get a little older you start to think about life after footy a little bit more and it hits home harder. “When I came out of the system after six years with Richmond, I felt like I had way more options, so that made the transition a lot easier. That’s not to say the defender wasn’t prepared to move on. In fact, he was ready to journey head first into his long-term plan of a career in the police force. But while life as a policeman had always been in the forefront of Dea’s mind, the reality of settling down into life after football without significant preparation proved confronting. “I was ready to go into the police force, I’d jumped through every hoop to go straight into the academy. “But I was having a personal re-think about what I wanted to do with my future and I thought another year of playing football would allow me to explore a few more options and I wouldn’t have to leave the club that I love. “(Joining the police) is something I’ve always been interested in, but in the last six months I’ve been reconsidering a lot of options and I probably have had tunnel vision on the police force for a while. “When you get a bit older you have a more wholistic view about what you want the rest of your life to look like and for me that meant shifting my focus away from the police force to some options that I hadn’t nurtured. “I found a lot of reassurance in thinking that I’d have another 12 months to look at some other career options, have a crack at another year and hopefully play some finals footy. But rather than dropping his head, Dea hit the track determined to prove himself once again, returning early from an overseas trip to train at The Hangar and have one final crack at earning a spot back on the list and reclaiming time to prepare for life off the field. By the end of November, he’d done just that and Essendon re-drafted Dea with pick 25 in the rookie draft. “I was ecstatic, I really was, just to be back at the club and around the boys,” he said. “Footy clubs move so quickly – you think the guys in the system will still have time for you, but the game moves too quickly and you are forgotten about so quickly. "Matt is a great clubman and our players are rapt a person of his calibre is back on the list." 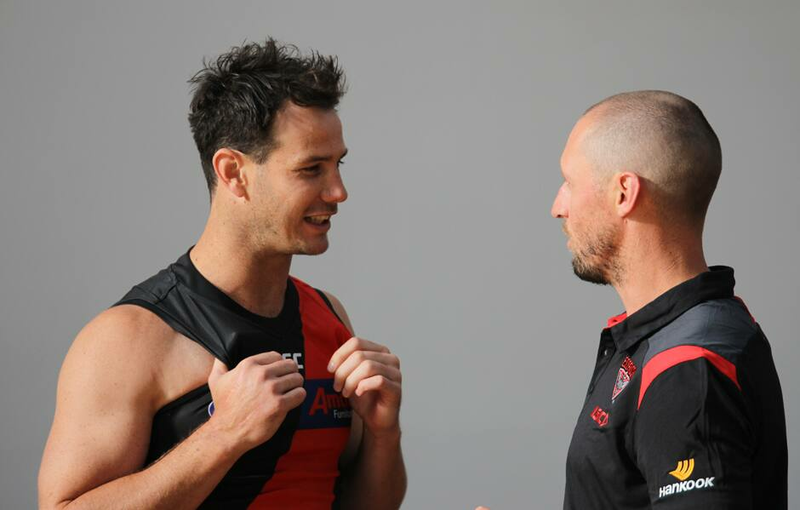 The decision to give the former top-up player a new contract would not have shocked people within the walls of the club – he is held in such high regard at Essendon, not just as a player, but also as a person. An immensely modest leader, he never fails to put others ahead of himself, even if that means compromising his own position in the senior line-up. “The only reason I’m here is purely just off-field work, I pride myself on being a good teammate and a good clubman. As soon as I go away from that and solely focusing on my own performance then I’m probably no good to anyone. “I think my greatest worth is to keep making other people better and if that means they leapfrog me than that’s the way it is. “That’s the culture that we have here, 10 years ago it was probably a different way of thinking for players. But regardless of his humble thoughts, it is clear 27-year-old can still have an impact in the AFL this year. In 2018 the Bombers won nine of the 12 senior games Dea took part in, and he averaged the third-highest disposal efficiency at the club in a strong display of skill and composure. The defensive stocks at the club are getting deeper, with young Bombers such as Aaron Francis, Jordan Ridley and Brandon Zerk-Thatcher showing bright signs in their development, but Dea isn’t worried about their competition. Instead, he will continue to take pride in helping them achieve their own dreams.